Admiral Sports is pleased to announce that the company has entered into a strategic partnership with Inter Nashville FC. “We’re very happy to work with Inter Nashville FC, a great new club from the NPSL,” Admiral Sports CEO Paul Hamburger stated. “Admiral has become the second largest brand to NPSL clubs because of our factory direct pricing, ability to make unique custom kits, and online ordering. NPSL clubs are looking at the market and realize it makes sense to choose Admiral. Inter Nashville FC is led by Pedro Reyes, Richard Askey, Jomo Cromwell, and Gift Ndam. Reyes is a successful businessman in Nashville and is the founder of the International Indoor Soccer Complex. He also formed a TSSA youth travel soccer club called International Soccer Club. Reyes is one of the owners of Inter Nashville FC. Askey served as Assistant Coach and Head Coach for the Nashville Metros (2004-2009) and Assistant Coach at Nashville FC (2015-2016). Askey is the First Team Head Coach and another owner of Inter Nashville FC. Cromwell has worked for both Rocket City United and Nashville Metros and brings a wealth of contacts and knowledge to the organization. In addition to being one of the owners, Cromwell will serve as Reserve Team Head Coach. Ndam will serve as the club’s GM. Inter Nashville FC is Nashville's community soccer club. They aim to represent Nashville's ethnic diversity on and off the field and have a positive impact on their community. Inter Nashville FC joined the NPSL in November 2016. They will compete in the league’s Southeast Conference in 2017. Admiral is a legendary brand, having been worn by some of the biggest names in the sporting world. The England National Team, Manchester United, and the New York Cosmos are just some of the clubs that once donned Admiral. In fact, Admiral has supplied most of the current EPL teams in addition to being the largest brand in the original NASL. The company, a pioneering brand in the truest sense, was recently the subject of an ITV documentary called Get Shirty. 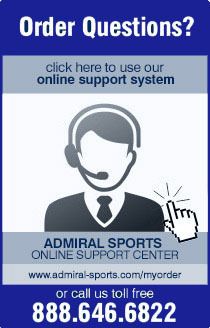 Today Admiral is a major player in the North American and international markets. The company is one of the largest soccer brands supplying professional teams in the U.S. in addition to supplying some of the top clubs and academies in Canada. Admiral has also become very involved in the soccer accessories market, providing innovative products to their customers. Admiral currently offers a wide range of accessories, including goals, bags, balls, goalkeeper gloves, referee supplies, and training equipment.